A Discovery of Witches is not for the faint of heart. It’s not scary or anything – it’s just dense. Diana Bishop is a witch who doesn’t want to be a witch, mainly because she believes her parents were murdered specifically for their use of magic. She views it as dangerous and longs for a simple, ordinary human life. But without realizing what she’s done, she suddenly finds herself drug into the middle of a multi-millennium-long struggle between witches, vampires, and all other sorts of magical creatures over the existence of a special book that she, apparently, has been able to call up from the depths of the library when all other requests have turned void. Oh, and despite being a witch, she can’t actually do any magic – at least, not well. Okay, so I have a few thoughts here. Firstly, Diana is an academic character. She’s in the midst of researching alchemy, and as a result, there’s an awful lot of academic language in the book. I often found myself a bit overwhelmed with the information and honestly wondered if a lot of it was really necessary. As a result, I found myself skimming multiple places, looking for an end to the bouts of excessive description and inner monologue that slowed the plot down. For a casual reader, there was a lot that could have been cut in this regard, but that’s just my preference. Diana is a likable, although somewhat frustrating, main character. I suppose this was to leave room for character growth, but there were a few points when I wanted to grab her shoulders and yell “DUH!” or “KNOCK IT OFF, ALREADY!” In general, though, she was smart, independent, and self-sufficient (or at least she’s supposed to be), which I think the literary world needs a bit more of. Additionally, Matthew, the vampire-turned-love-interest (I feel a bit silly saying that) is a pretty interesting character. He’s old as sin, which I admit was a little creepy, but his character is kind and appealing, albeit a bit intrusive with his whole watch-you-sleeping thing. He did remind me a bit of Edward, from Twilight, in the whole tortured, existential vampire crisis he continually goes through. But I also liked him better than Edward, so there’s that. Now on to the plot. This is a pretty good story. I finished it in a day or two, because I couldn’t put it down. 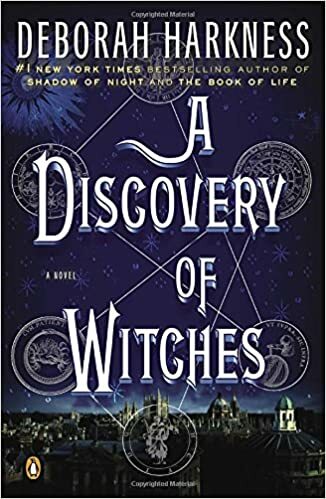 It’s intriguing, a diverse mix of history, science, mystery, and PG romance that reminded me of an academic Twilight (again, I’m a bit ashamed to confess that). My favorite part was watching the relationship between Diana and Matthew develop (again, ignoring the creepy age), because they worked well together. I wish some questions (mainly, “What the heck is in the Ashmole 782?”) had been better answered in this novel, but seeing as how it’s the first in a trilogy, that would have completely undermined the need for future novels. So, I get it. I honestly had initially thought I’d rate this 5 stars, but after sitting on it for a couple of weeks, I’ve dropped it down to a 4. If it had been more thoroughly edited and a lot of the superlative description and information had been cut, I’d easily give it a 5. But the fact that I skimmed so much in order to keep up the pace of the story is a big detractor. I’m currently reading the sequel, Book of Shadows, and feel as though I’m slowly trudging through it (again, it needs editing). Will I finish the whole trilogy? Honestly not sure at this point. This second book is… long. I did see that there’s a new television series coming out based on the trilogy, and I am interested in seeing it, so there’s that!